Developing some ideas in the Moleskine, with a drop of John Eaves concept art for inspiration. I’m going through a really heavy phase in my Star Trek fandom. It waxes and wanes, and at the moment I can’t get enough of it. And the kind of nerd I am, I need to create. I have wanted, for some time, to scratch-build a really nice model of an Excelsior-class ship, or a variant thereof. 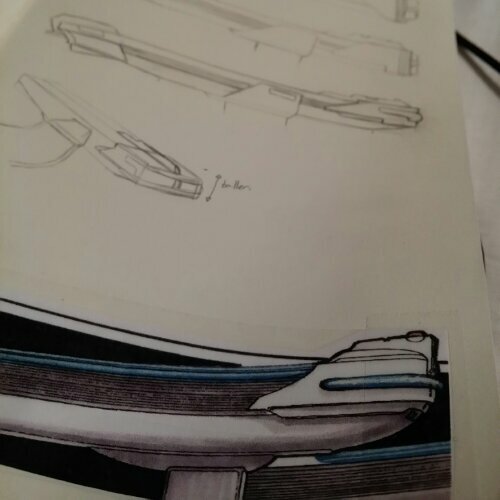 The sticking point has been the nacelles. Fortunately, with some time spent in Star Trek Online recently, I think I’m getting the look of the Excelsior-update locked down. Also, I’m being all sorts of inspired by the Star Trek: Excelsior audio drama. It’s not the greatest Star Trek I’ve ever enjoyed, but I am really enjoying it. If you’re into Star Trek, podcasts, or radio plays, it’s worth checking out. Tagged excelsior, fandom, nerd, star trek. Bookmark the permalink.